The number of people who have died in floods and landslides triggered by “historic” levels of torrential rain in Japan has climbed to at least 155, with dozens of others still missing. Almost 2 million people were still subject to evacuation orders on Monday, while tens of thousands of rescue workers battled mud, water and rubble to search for survivors stranded in their homes. At one point about 5 million people were told or advised to evacuate. Some of those who decided to stay home found themselves trapped by rapidly rising water or landslides. The heaviest rainfall seen in Japan for decades has caused destruction over large parts of the country, particularly in Hiroshima and other parts of the south-west, making it difficult for authorities to assess the damage and the number of casualties. Some media reports said 60 people were still unaccounted for, while Japan’s public broadcaster NHK put the number of missing at 79. The prime minister, Shinzo Abe, cancelled a trip to Europe and the Middle East that was due to start on Wednesday and expanded the search and rescue effort, which involves 73,000 members of the self-defence force, police officers, firefighters and coastguard personnel. Aided by hundreds of helicopters and paddle boats, rescue workers continued to rescue people from buildings, some of them stranded on rooftops only metres above the waterline. On Sunday, Abe said efforts to locate those still stranded had turned into a “race against time”. In one of the most dramatic rescues, patients and staff – some still in their pyjamas – were helped from the balcony of a hospital in the city of Kurashiki on Sunday and rowed to safety on military paddle boats. Officials said 170 patients and staff had been evacuated from the hospital, while NHK later said about 80 people were still stranded. TV footage from across the affected region showed rivers that had burst their banks, submerged vehicles and houses destroyed by landslides. The rains are the worst weather-related disaster in Japan since two typhoons struck in quick succession in August and September 2011, killing nearly 100 people. The death toll is higher than that seen in 2014, when more than 70 people died in landslides caused by torrential rain in Hiroshima. Parts of south-western Japan had as much as 10cm per hour of rain, the highest in decades, the meteorological agency said. By Monday morning, the rain had eased off in the worst-affected areas, with soaring temperatures presenting a new health risk to people left without water and electricity. “We cannot take baths, the toilet doesn’t work and our food stockpile is running low,” said Yumeko Matsui, whose home has been without water since Saturday. Kaori Ito, the mayor of Kurashiki, said thousands of evacuees were in desperate need of clothes. “Nobody has anything to wear. We need shirts, trousers, underwear, socks and even shoes,” Ito told the Asahi Shimbun newspaper. More than 30,000 people were staying at emergency shelters on Sunday afternoon, while authorities vowed to quickly rehouse displaced people in private accommodation or public housing. The meteorological agency described the situation as one of “extreme danger” and warned of further landslides, even as the water recedes. Younger victims included two sisters who attended a primary school with just six pupils on the sparsely populated island of Nuwa. “The disaster happened so suddenly, I am struggling to come to terms with it,” the school’s principal said. 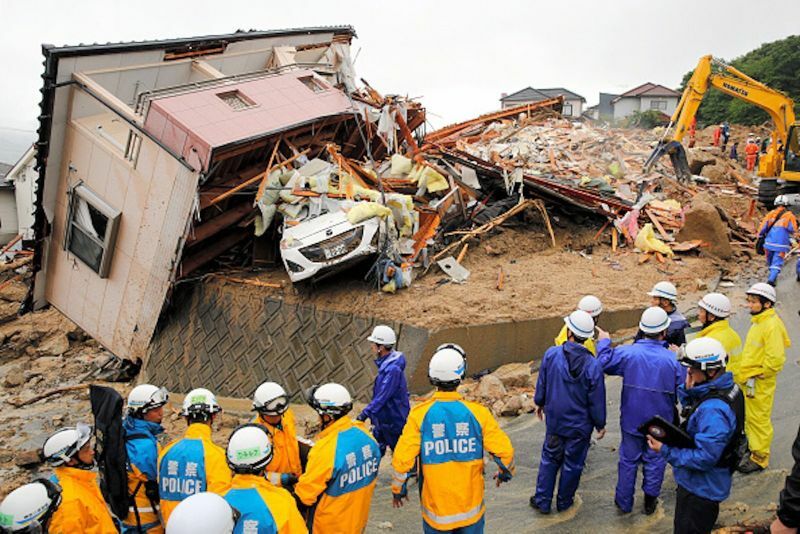 In Hiroshima prefecture, rescue workers found the body of a three-year-old girl whose home had been hit by a landslide. 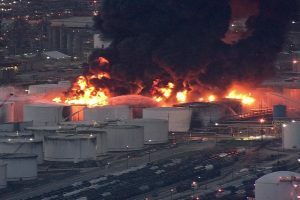 The disaster has affected manufacturers with plants in western Japan. The carmakers Mazda and Daihatsu said they had suspended operations at factories in three prefectures because they were unable to procure parts.